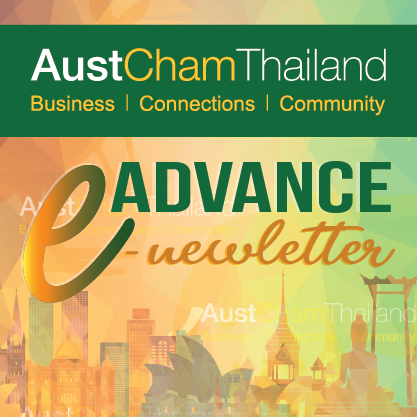 On Wednesday 23 August 2017, The Australian-Thai Chamber of Commerce (AustCham) in collaboration with the American Chamber of Commerce in Thailand (AMCHAM), British Chamber of Commerce Thailand (BCCT), Franco-Thai Chamber of Commerce (FTCC), Netherlands-Thai Chamber of Commerce (NTCC) and the South African – Thai Chamber of Commerce (SATCC) had organised Joint Business Luncheon Meeting on “Plans for the Digital Economy Fund”. It was our honor to welcome H.E. Dr. Pichet Durongkaveroj, Minister of Digital Economy and Society, as well as the Alumni of the Year 2017, as the special guest speaker. Dr. Pichet had provided us with crucial updates on the Thai government’s “Digital Fund” being set up to support digital entrepreneurs and start-ups, with funding to be distributed beginning in September. Not to mention, the government’s mega project, the “Digital Park” planned for the Eastern Seaboard, and how AustCham members can access and acquire benefit from digital initiatives of Thai government. This event was held at SO Sofitel Bangkok. On Monday 21 August, AustCham welcomed the Hon Martin Hamilton Smith MP, Minister for Investment and Trade as he led a South Australian business delegation to Thailand. As part of this visit, we organized a reception to meet the delegation, and celebrate areas of engagement between South Australia and Thailand, which included showcasing some of South Australia’s premium wine. This event was held at Anantara Siam Hotel. On Thursday 17 August, AustCham welcomed a delegation from the Victorian State Government, to attend the Victorian Connection Events – Panel Forum and Networking. Led by the Hon Philip Dalidakis MP, Minister for Small Business, Innovation and Trade, Victoria Australia, the Panel Forum featured special guests from William Angliss Institute, Wandee Culinary Technological College & Wandee Media, and Coro Field. This event was held at Novotel Bangkok Sukhumvit 20. On Wednesday 16 August, AustCham, in collaboration with BCCT (Host), NTCC, FTCC, CANCHAM, AustCham, AMCHAM, BeLuThai, EABC and Irish-Thai Chamber of Commerce, attended the BCCT Multi-Chambers Lunch on Thailand Tourism Market 2017-2018 presented by Mr.Yuthasak Supasorn, Governor of Tourism Authority of Thailand (TAT). This event was held at Bangkok Marriott Hotel Sukhumvit, Sukhumvit soi 57. On Wednesday 2 August, AustCham Members attended a pre-Sundowners panel discussion on Health & Well-being strategies for the workplace with panel members from Virgin Active, Bumrungrad Hospital and ANZ. This briefing focused the growing importance companies are placing on promoting employee well-being to enhance company performance. The briefing was held at Novotel Bangkok Sukhumvit 20. Previous Australian property: the exception or the rule?